It's creeping up! We've got one week to go. Are you buying into it, are you not? Either way as I've said it's a chance to spend a no distractions night with your partner. Visit your favourite places, eat your favourite dishes and indulge in each other. Here's a snap shot into my perfect Valentines, Chocolate covered strawberries (who knew these were so good! I've only just tried them, hello delicious! 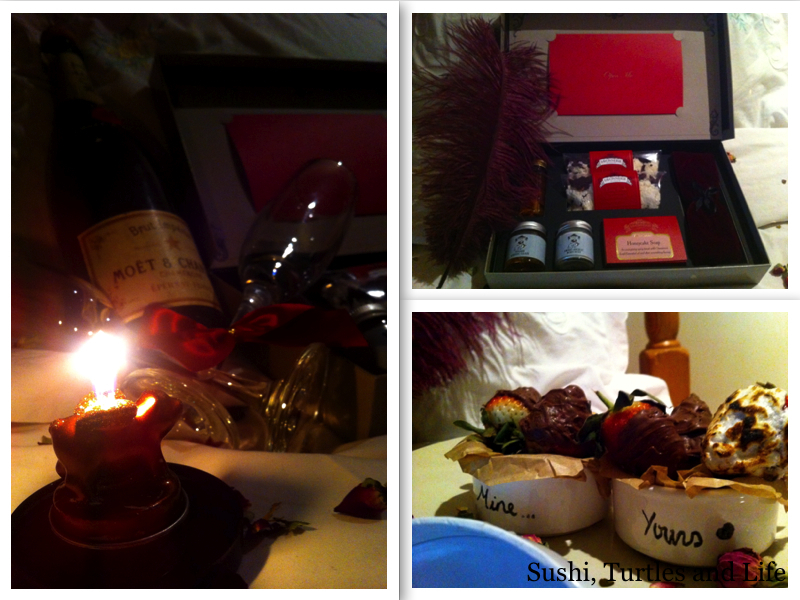 ), jewellery, rose petals, champagne and pamper! If you haven't heard of Savonnerie London yet, where have you been? If you love to pamper yourself and relax they have just about everything you need elegantly packed for maximum indulgence. Looks like romance just exploded all over my room. I bring you, The (ever so slightly) naughty weekend kit. It's everything you would expect from a classy kit for lovers. I quote 'There are no rules to love, but may we suggest...' yes, yes you may! This gorgeous kit comes with a Honey cake natural soap, Love soak relaxing bath therapy, Vetiver massage oil, Angelic body dust, Tender kissing glaze, Velvet blind fold, Instruction card and a luxury burgundy feather. Well that was a mouthful, this weekend kit really is jam packed to last all weekend. So you can run a bath for two, take a dip in the sensual aroma of the love soak and then follow with your massage oil. I'm not giving too much away with the instructions because that's a cheeky surprise for you. But it gives some suggestions of how to get the best experience from the products. Cute little shells in the massage oil! N'awww! I'm in love with the love soak. It really is just so relaxing, the smell is so gentle and calm, but the salts itself dissolve completely in warm water so there's no gritty bath when you get in. 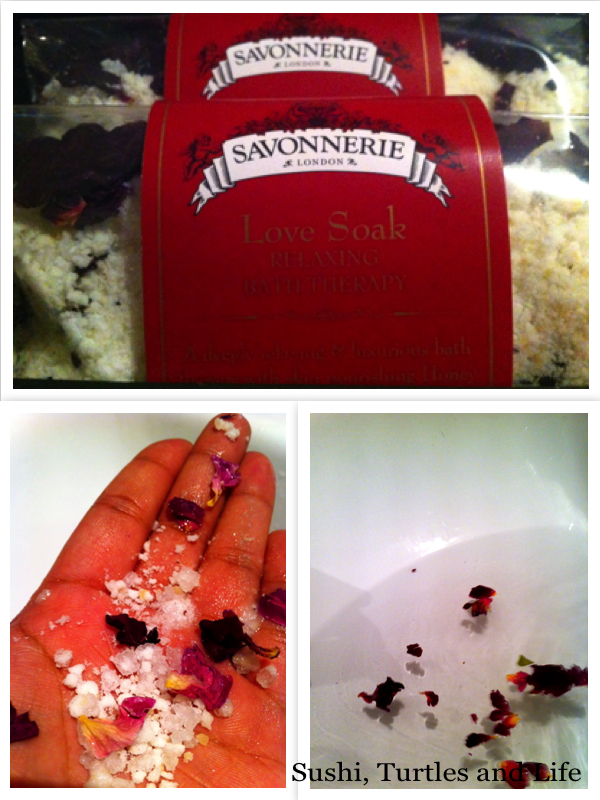 The petals gently float around you and when you get out your skin is completely moisturised and far from oily. Love soak is packed with jojoba oil, honey and exotic ylang ylang, we all know how good those are! The whole Savonnerie range is completely natural and free from those harsh chemicals, bonus. 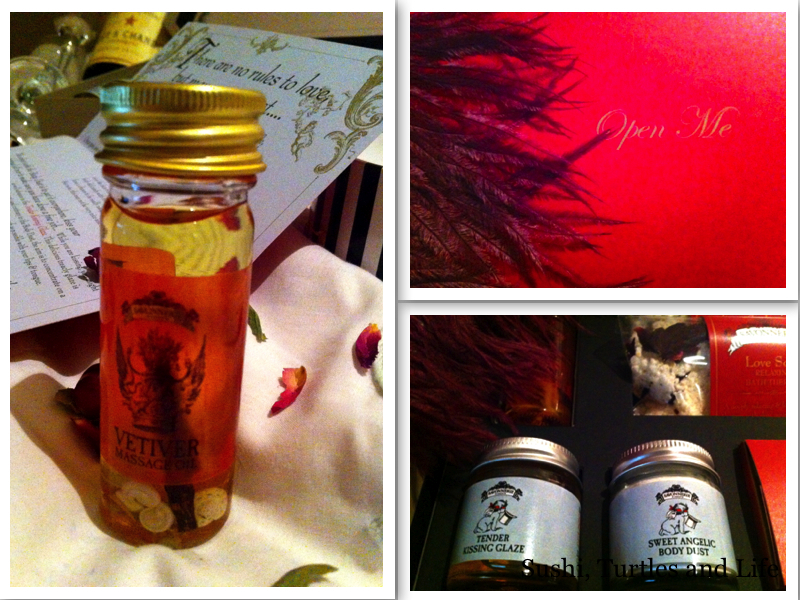 The attention to detail and quality in this box is really what makes it feel so special. This looks so awesome, I have to try and find something similar in stores here. Damn, why does Australia have to be so far away from everywhere!